KIWI Services Thompsons rug repair team awaits your call. If you have a rug repair problem that you cannot decide how to fix – leave it to our KIWI Thompsons rug weaving experts! 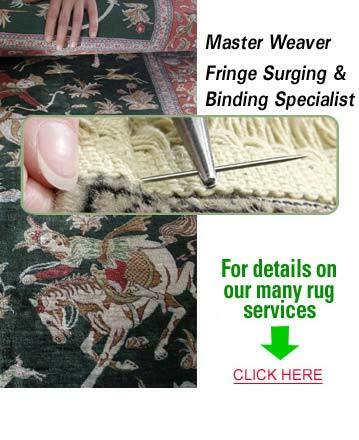 We repair persian rugs, oriental rugs, indian rugs and berber rugs. To be quite honest, our Thompsons oriental rug weavers have yet to encounter a type of rug that they cannot fix! Every rug has different weave patterns, designs, and fringe attachments. That’s no problem for our experts! They can follow your instructions to the letter and have your favorite rug looking exactly the way you want it. Our Binding Specialist and Senior Rug Expert are always on hand to follow your instructions exactly. If there is an area on the rug that you don’t want them to repair because you like the way it looks – they’ll listen. The KIWI Services Tompson rug weaving Experts are available to satisfy you. Why not call today and schedule a free estimate? We’re rug weaving and rug repairing services in Thompsons, Texas. We’re KIWI Services.